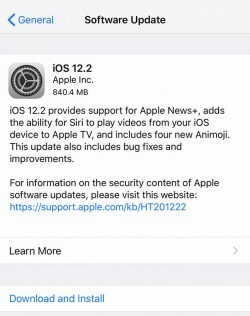 Following its big event today, Apple is now releasing iOS 12.2 for supported iPhones, iPads, and iPod touch devices. This version of the company's mobile operating system adds support for the newly unveiled Apple News+ service, which is already available in the US and Canada, and is coming soon to the UK and Australia. For a monthly fee of $9.99 in the US or CAD 12.99 in Canada, you get access to more than 300 magazines, "leading newspapers", and digital publications, presented in a beautiful way, with animated covers, vivid photography, and bold typography. Apple News+ lives inside the Apple News app that's preinstalled in iOS, but the app will still also have the free content you may have gotten used to already. Aside from this, iOS 12.2 also introduces four new Animoji - a giraffe, shark, boar, and owl. The newest version of the OS supports Apple's second generation AirPods as well. Dedicated TV controls will show up in Control Center and on the lock screen, and AirPlay multitasking lets you browse other apps and play other short form audio and video files locally on your device without interrupting AirPlay. Moving on, you can now set downtime hours with a different schedule for each day of the week, and a new info field in Settings will tell you how much time remains on your device's warranty period. Oh, and if you're on AT&T you'll see the fake 5G icon starting with this update. Additionally, Siri can now play videos from your iOS device to your Apple TV. And of course there are the usual "bug fixes and improvements" baked in for good measure. Omg! Airplay. I'm so excited to use it too. It so life changing.